Johnny Spinelli - Animator: Animation... What is it? So what do we do as animators? Before I can explain what our job as animators entails, I need to tell you a little about other important jobs. Without these people, it would be impossible for us to animate. Concept Artist: These are the people that basically get the ball rolling when it comes to the design of the characters in a production. Once their concepts are approved, they are passed on to a Modeler. Modeler: This is the person that uses the concept art to create the character in 3D. Think of it as sculpting using a computer. We set positions, rotations, and/or scaling (i.e., changing the size) to the controllers called “keys” on various frames which are on the timeline. The software fills in the gaps. 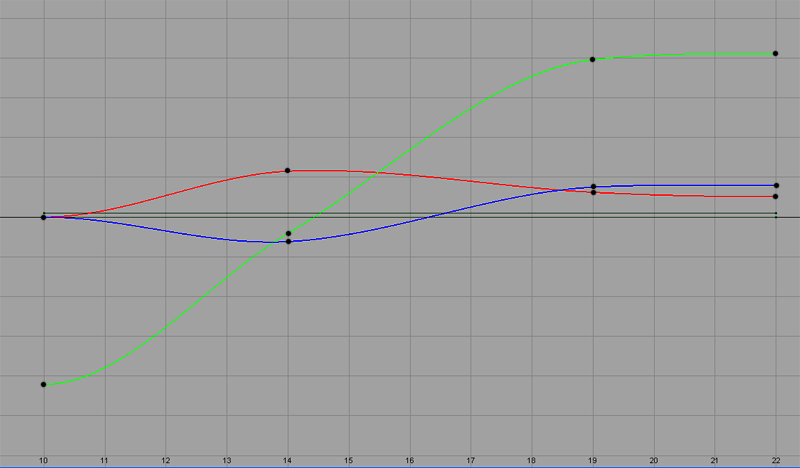 Animators use what is called an Fcurve Editor (F stands for Function) or Graph Editor to see the value of the keys in the animation. 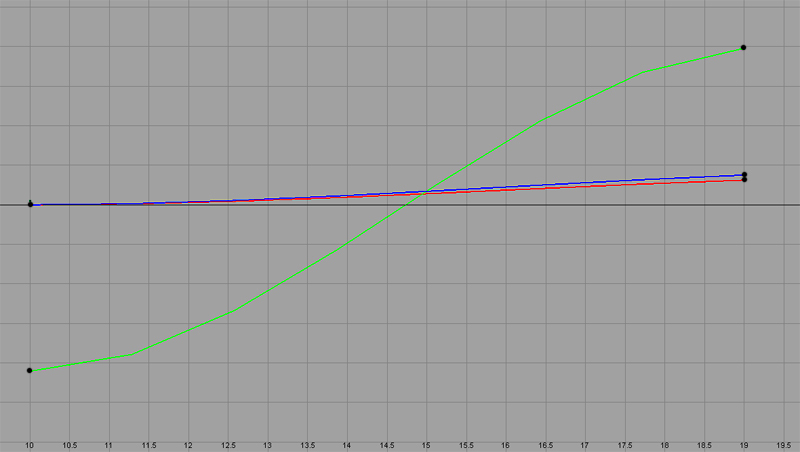 The Fcurve editor looks something like this for this particular animation. 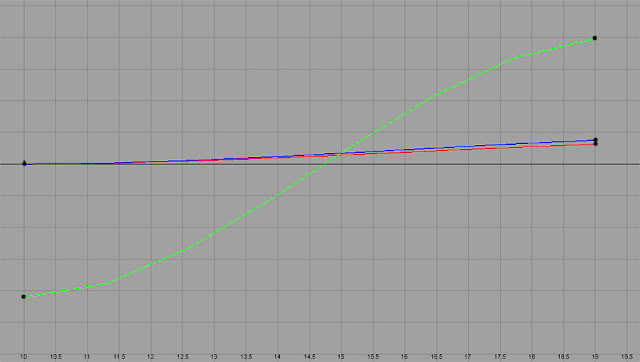 The green line indicates the value of his head from right to left, the red line is the value from up and down, and the blue line tells us the tilt of his head. In this next example, I have the same head turn but I’ve set two additional keys to give it a little life. In the middle of his head turn he dips his head down, and then it settles into it’s final rotation at frame 22. 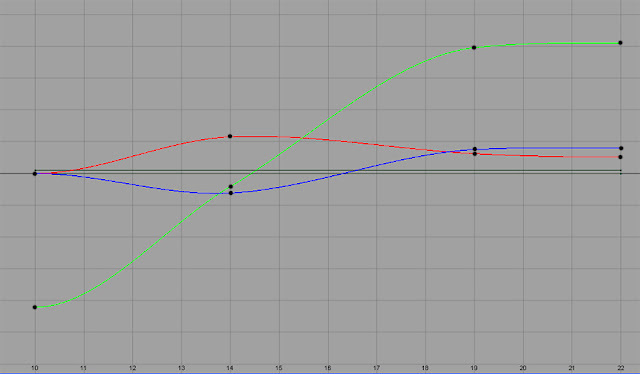 Here's the Fcurve editor of this animation. Notice how the values look different. Animators always try to control as much of their animation as possible, and try not to leave anything for the software to interpret. It’s not as complicated as it sounds, but it takes a lot more time than you think. The average animator has a quota of around 8 seconds a week. Yes ... 8 seconds! In one year working on Rango, I calculated having worked on 5 ½ from a total of 107 minutes in the film! As animators it’s more than putting together a few keys and poses, but rather, it is giving the character life and emotion. Here’s a youtube video that gives a pretty good representation of what it takes to make a 3D film. Pretty funny too!